Thank you for your interest in the Christian Aid White Horse Walk! This is going to be a very special sponsored event starting on Saturday April 27 and finishing on Tuesday April 30. The event will start with a Big Brekkie in Westbury, to which you are all invited – a great way to build your strength ready for the first day’s trek. We are hoping that many walkers will choose to complete all 4-days of the walk, with each day covering between 12-17 miles, 60 in total. Others may prefer to sign up for one or two legs/days of the hike. Enroute we will take in eight white horses around Westbury, Devizes, Cherhill, Broad Town, Hackpen, Marlborough, Pewsey and Alton Barnes. Refreshments and a warm welcome will be provided by Christian Aid supporters along the route. We’re raising funds for Christian Aid Week 2019 – which is focussing on Mothers in Sierra Leone who suffer from lack of medical support during childbirth (ten women in Sierra Leone die every die in child birth). For more info on the theme: https://www.christianaid.org.uk/christian-aid-week. We are hoping that each full distance walker will try to raise a target of £200 (inc. gift aid). To register for the walk please print and complete WWSW Reg Form and email/post it back to Bristol@christian-aid.org or call the Bristol Office on 01454 415 923. Please indicate in your email/letter, which parts of the walk you intend to take part in. 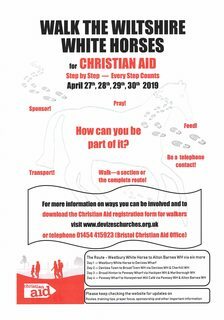 Once you have registered with Christian Aid for the White Horse Walk, you will receive a follow up email about how to start your fundraising; more info on each day; and the option to have a Christian Aid t-shirt or tabard for the event. Please download and print a copy of White Horse Walk p4 to put up. We look forward to having you on board for this new and exciting event in Wiltshire! More people to sign up, and not just think about it! Dry weather over the next four weeks so that the route will be dry enough to make the swampy/muddy areas of the route as less strenuous as we can hope for! Planning: That we may plan wisely and thoroughly and take advantage of the support of Christian Aid and all volunteers. That the administration will be as seamless as possible so that the event does not strain the (very) few organisers. Volunteers: That volunteers will feel led to become involved in the early planning and organising as well as with the walk itself. Walkers: Take the training walks seriously. That those planning to walk all or part(s) of the course will take the obligation seriously and begin now to train their body to cope with the nature of the walk which is likely to be strenuous in many places. Sponsorship: That we as an entire group will reach or exceed our target of £ 8,000 for Christian Aid week. That walkers may all feel able to ask for sponsorship (some people find it hard to ask for money) and that publicity will inspire people to take an interest and give generously. Unity: That all local churches will embrace this walk and so publicise and support it. That the walk and planning of it will build relationships and community among our churches.